I absolutely LOVE how this quilt turned out! And not to toot my horn or anything....but I did the whole thing myself. 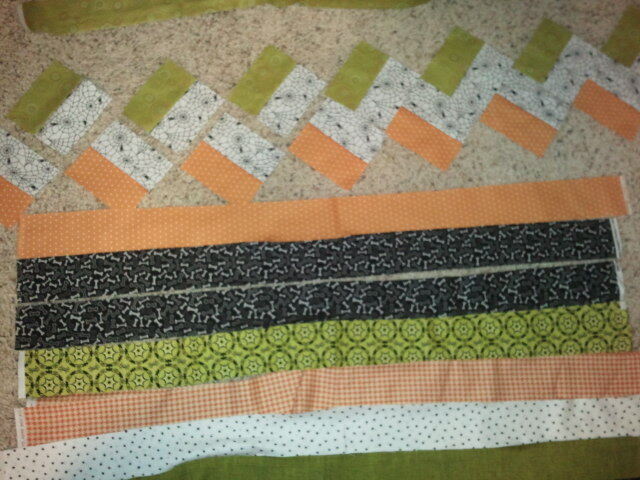 Even the quilting. Yup. Would you like to make one of your very own? I know you are thinking it looks hard. Not to worry, it was super easy. Just scroll down and take a look at the tutorial pictures and see for yourself! You will need (19) 1/4 yard cuts. Not fat quarters, quarter yards. You can use less that 19 prints if you want to repeat a few. 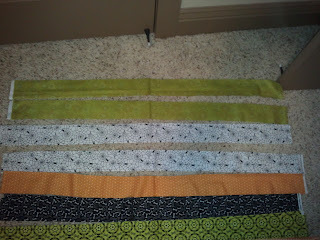 Then you will cut (2) 3"x44" strips from each of your 1/4 yards. So you will have to 2 strips of each print. 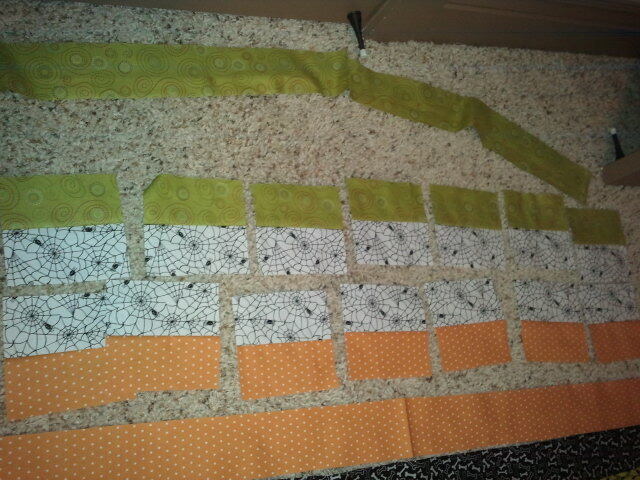 38 strips all together. 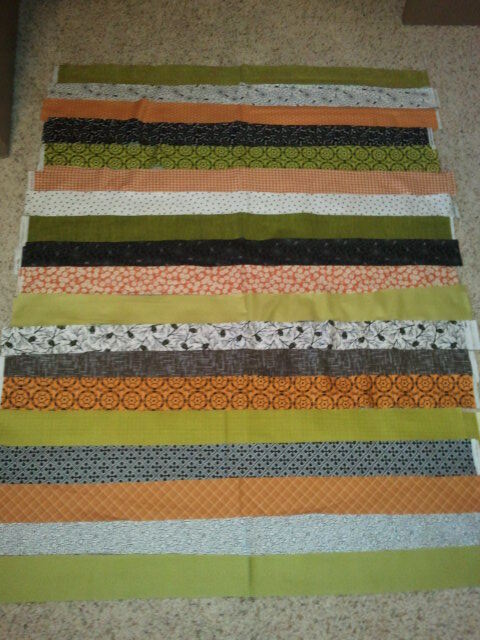 I next laid my strips on top of each other, in the order that I wanted the quilt. 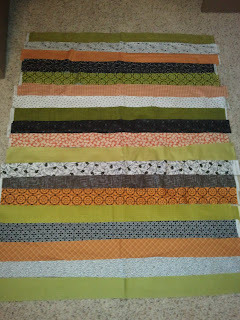 Start at the top of the quilt and lay out the first 4 strips, here it is the 2 green and the 2 white spider web strips. 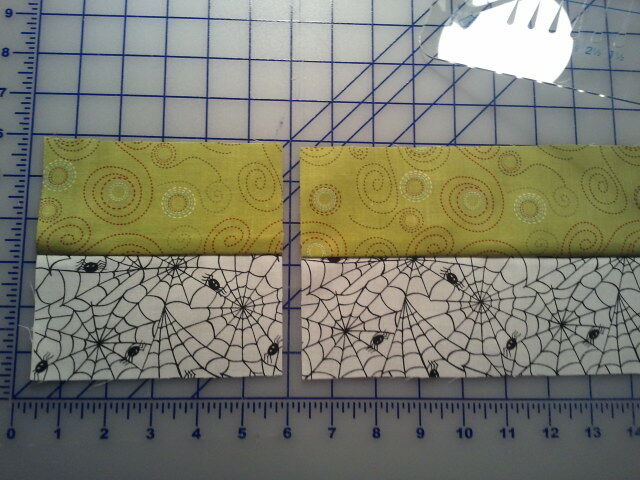 Take 1 green strip, and on White Spider web strip and sew them right sides together, lengthwise. 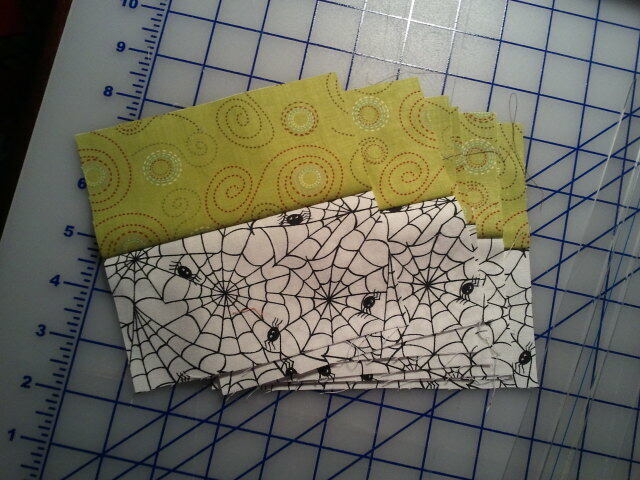 And then press the seam towards the darker print, so the green one in this case. Next you are going to cut 5.5" squares out of your strip. You should get 7 squares from 1 strip. Sorry for the horrible pictures, they are from my phone! 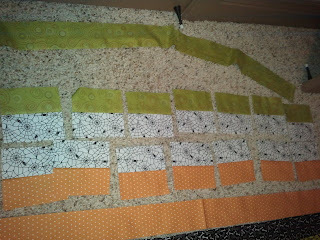 Lay your squares at the top of the quilt like this. 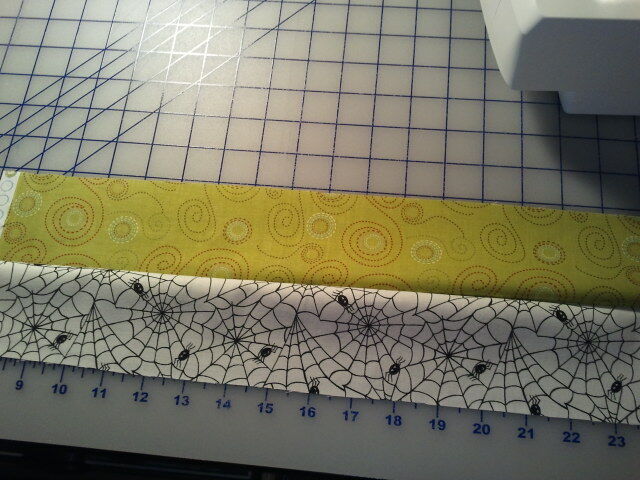 Now, take the other white spider web strip, and then one of the next strip down, and do the same thing. Now, all you need to do is turn those squares to start forming your chevron design. Now just repeat that pattern. Take the other orange strip, and then 1 of the black strips and sew, cut and place. After those first two rows, it is pretty easy to see where the next rows fit in. Repeat all these steps until you sewn every row. Now you can start pieces your squares together. 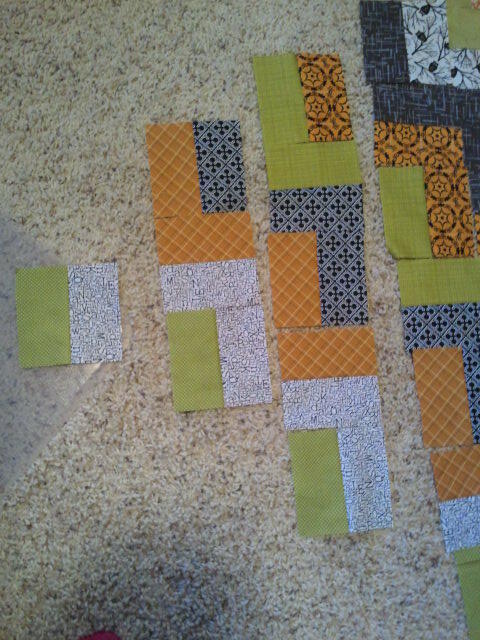 Start in 1 corner of the quilt, and start sewing the rows diagonally together, to make diagonal strips. Once you have all your diagonal rows formed, start joining them on the diagonal. 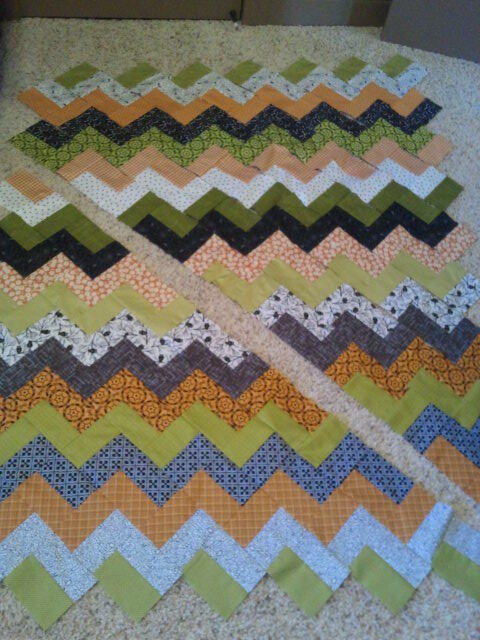 Once you have the whole quilt put together, just trim off all the jagged edges. 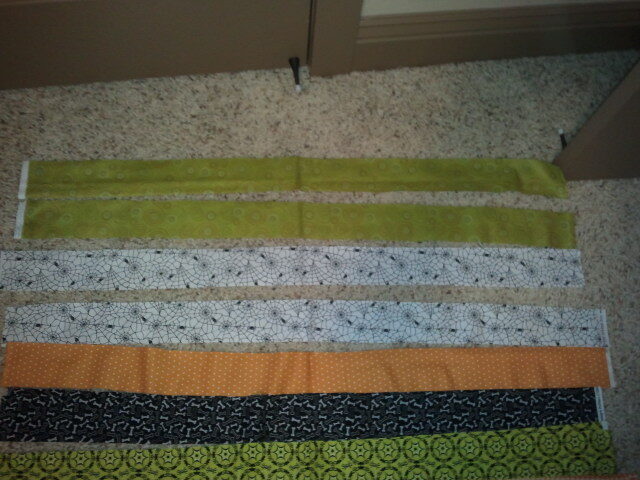 Then quilt, bind and your done! 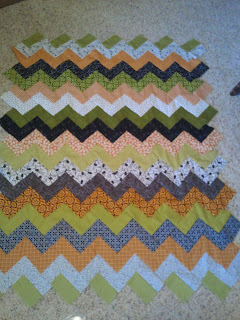 Like I mentioned before, I quilted this one myself. Just straight lines, but I was still pretty proud of myself. I love it. Now I just need to figure out where I want to put it! Can you just image how cute this pattern would be with red and white fabric for Christmas! Ooooh, I am drooling already! I know we haven't even hit Halloween yet, but now is the best time to get started on all those Christmas projects and handmade gifts! Christmas will be here before we know it! 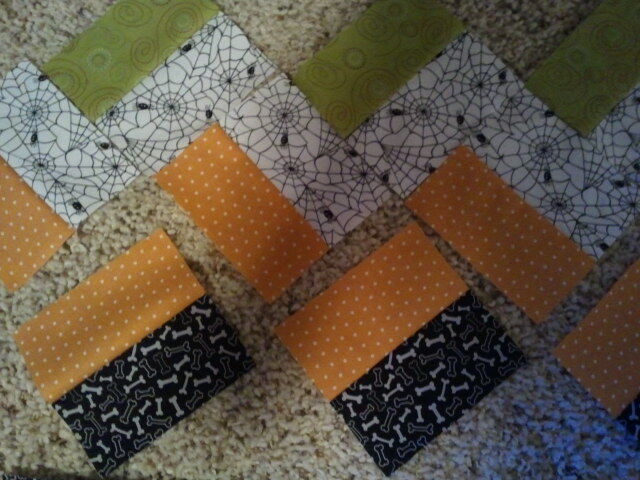 I am getting started on my Christmas quilt.....and I am SEW EXCITED! This is gorgeous! Thanks so much for sharing how to make it, this may be one I have to try! Wow this is beautiful! Great colors for Halloween. And I love your fireplace too. I have a link party starting tonight at 8pm that runs through Monday night. I would love to see you there! 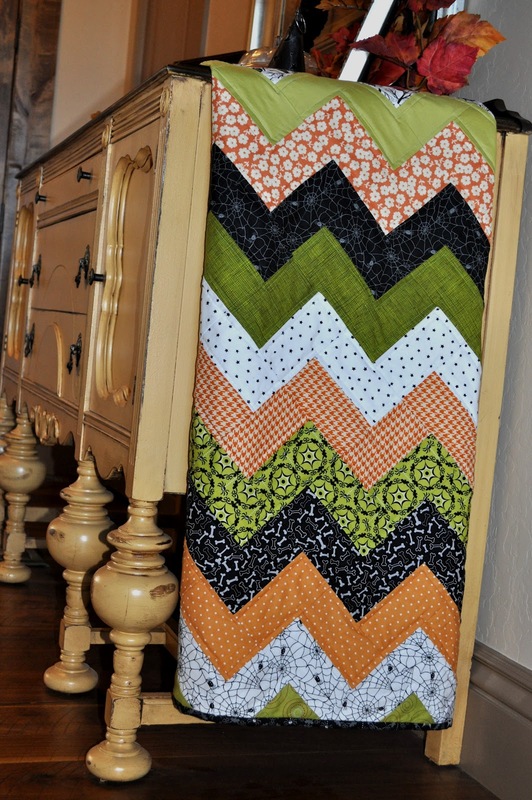 LOVE this and am planning to make it with different fabric! This is a super technique for chevrons! Thanks for sharing. Hi Ladies! The finished quilt is 45"x58". Happy Sewing! Love this! 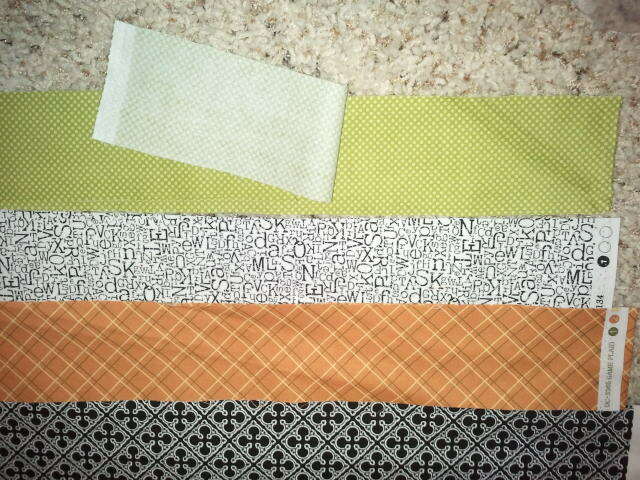 I am going to make it in Christmas fabrics. Thank you very much! What a gorgeous, fun quilt! Thank you so much for posting your tutorial. I can't wait to get started on one of my own. Thanks for the tutorial however there does not seem to be any mention of the seam allowance. 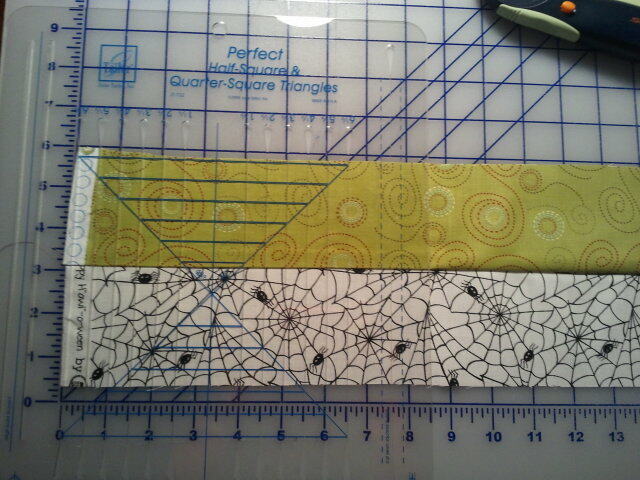 As I am doubling this pattern and making a 90x90 quilt it appears the seam allowance is 1/4 inch. Is that correct?? Hi Marsha! 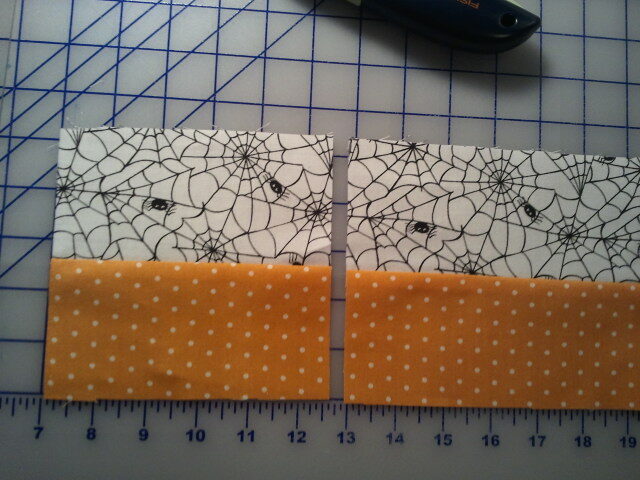 Yes, I used 1/4" seam allowance. Happy Sewing! I saw this on Pinterest Friday night and went out Sunday to the fabric store to make mine! 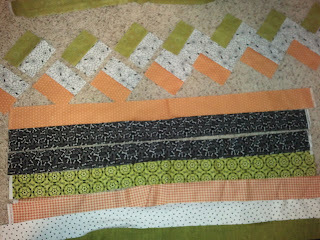 I've only done log cabin quilts before, but this was just as easy! I used "winter prints" so that I could use the quilt beyond Christmas. Thanks for the inspiration! 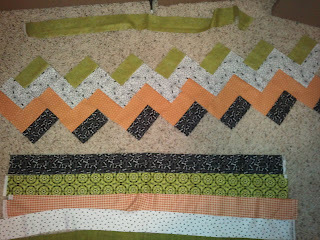 I got the top done today and hope to start quilting it tomorrow. I love this.... would this work with just two or three different fabrics? I wonder if i would still be able to get the same effect???? LOVE IT! 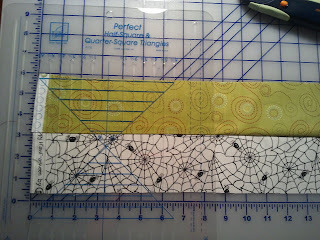 I am not a quilter, but I might try this same idea with paper to create this pattern on a scrapbook layout. This looks so difficult to make but your tutorial is so easy to follow! I'm going to order my fabrics now! Thank you! 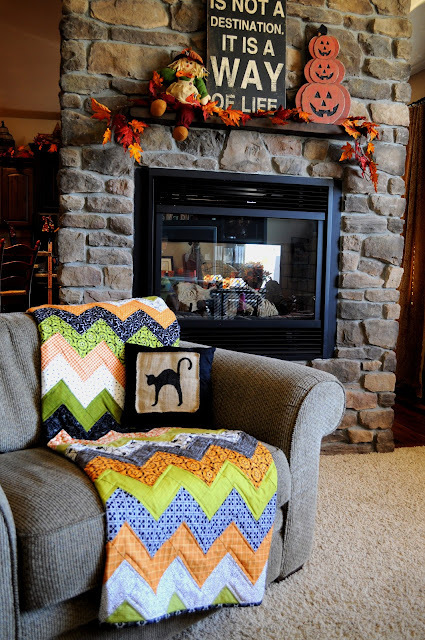 Could you list the fabric you used in this quilt? This tutorial is absolutely adorable. I, a 14 year old, made this easily. I myself have made about ten quilts and taught my friend how to quilt with this pattern. We personalized it by adding triangles to the edges rather than trimming them. We also added 2 borders. WOW - this is PERFECT!!! 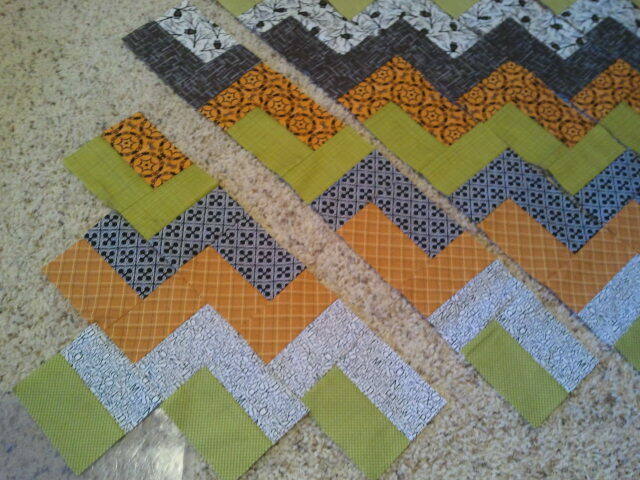 I did not want to do a bunch of HSTs to do a zig zag quilt. Thank you so much for sharing this tutorial. This will be my weekend project! I'm starting this today. I love your quilt. Thanks for the tutorial. 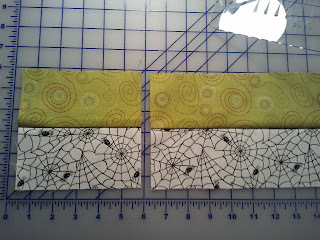 How much fabric will I need for backing and binding? 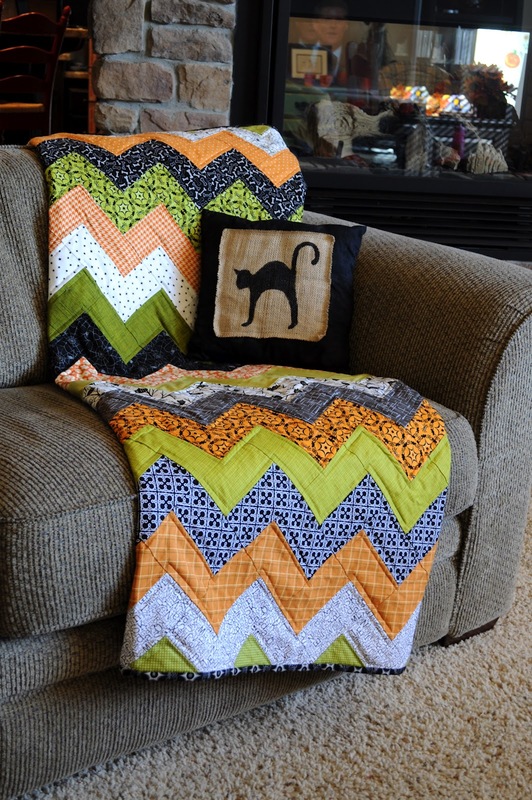 Thanks for sharing such a cute quilt. 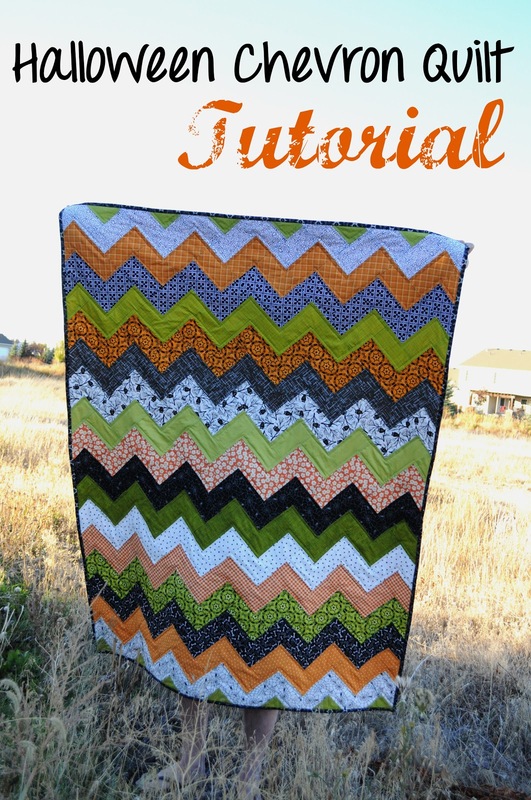 I have been searching for a doable chevron quilt and this one looks perfect. Thank you!! I am a watch n learn person! So making my chevron quilt now! This was so simple and adorable!! Thank you for posting on Pinterest! Wow thank you for this pattern! 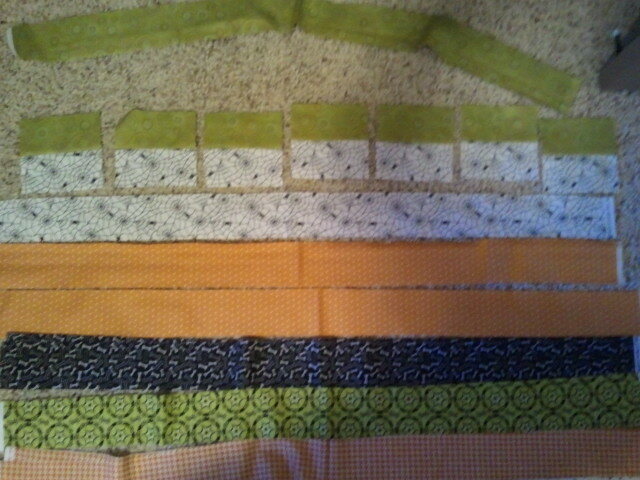 I've already cut out all of the strips of fabric and I can't wait to get started. 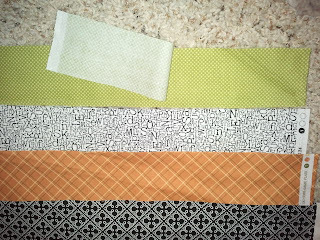 I plan on using alternating white and teal fabric with an ombre effect. 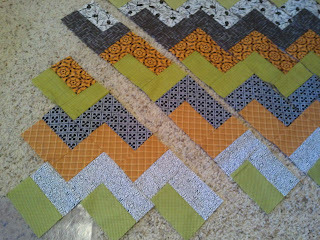 I posted a link to your pattern on my blog. Made this afternoon for my new baby nephew! 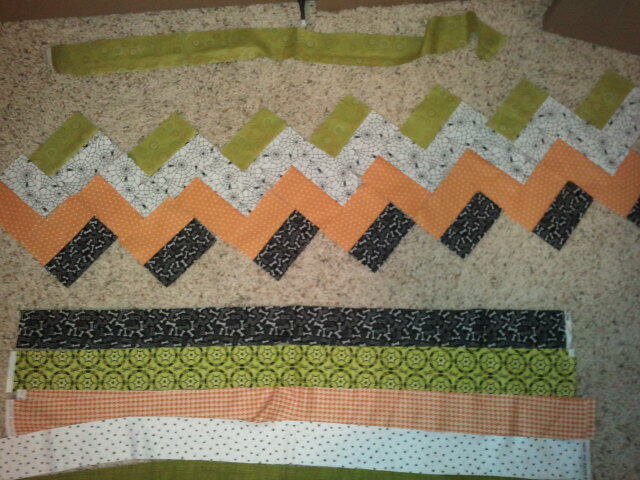 Used 2 inch strips for a little carrier quilt since he's a preemie! LOved IT! So Quick and Cute! Thanks for the tut! 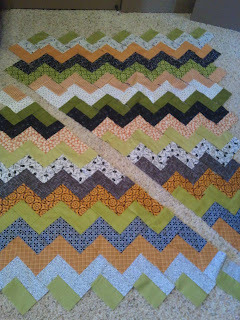 I am having the hardest time with this quilt! Everything was so easy until I started laying out. I cant figure out the ends and just can't figure out what I'm doing wrong. I have pinned this on Pinterest, and have also linked to it on my blog. Can't wait to make this! I was browsing for Halloween related blogs and I came by your post. Please allow me to pin some remarkable photos in here :D Thank you so much! I’m also sharing a post of the usual activities in our country, for some of you to know what is halloween in the Philippines . Cheers and keep up writing nice posts ! I did it!,,, thanks so much for tutorial! I am so thankful for this post! 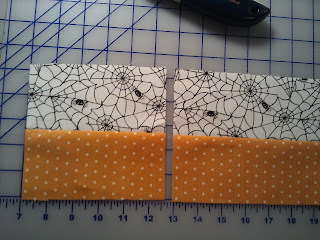 I used the nautical fabric from fat quarter shop and it turned out great!! I would love to see it in Kaffe Fasett, Amy Butler, or Joel Dewberry! lovely! What's the finished size of your quilt? 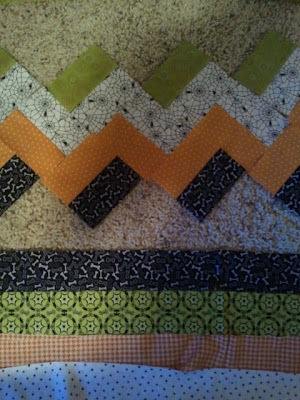 I put a link to this quilt tutorial on my blog tandbproducts.wordpress.com... I love the way it turned out. Thank you for sharing! 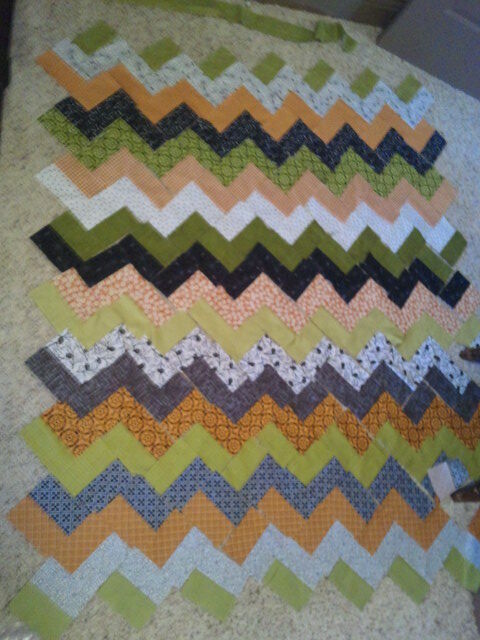 OHMYGosh, love this quilt. I am going to give it a go, using reproduction fabrics. Hope it is simple as it looks!!!! How much fabric did you purchase for the backing? I want to use flannel and get it before it sells out. I am already working on it for Christmas. When you quilted it did you use a walking foot? I love this design and have made the quilt top but now I'm not sure if I need to get a walking foot or not. Thanks for the tutorial!! Thanks for the directions. I found them on pinterest. 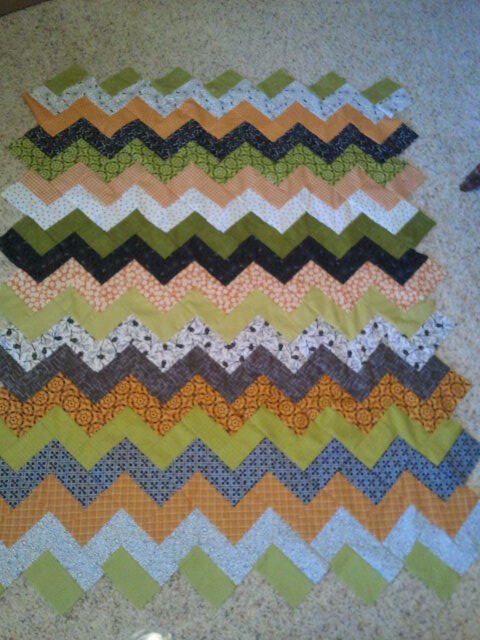 I made it as a baby quilt and with fewer fabrics. Turned out great. 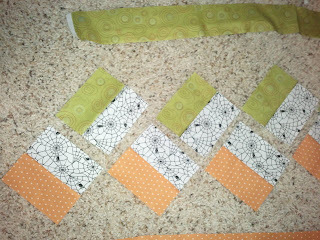 Much easier, I think, than using a bunch of half square triangles. 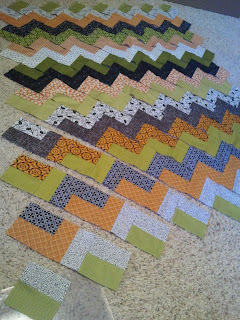 I would like to teach this technique to some friends at a quilt retreat later this year. Do you have a copyright that I need to worry about? 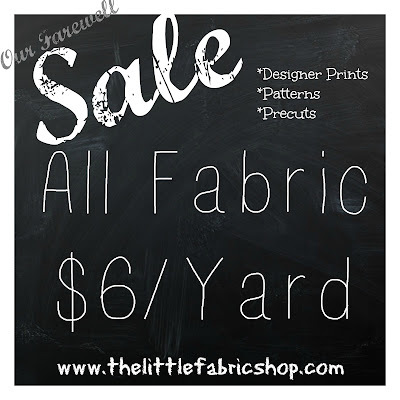 patterned fabric : Explore our big selection of fabric, Chantilly lace, buy cotton, patterned fabric, buy silk and chiffon. We are best Online Fabric Store in Dubai buy silk & patterned fabric. Thanks for the best blog .it was very useful for me. keep sharing such ideas in the future as well. This was actually what I was looking for, and I am glad to came here! 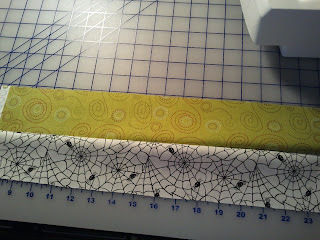 Very beautiful and quite easy.can I make this with two jelly rolls?but all are dark prints. Thank you for the directions! Very easy to follow! Just finished my Halloween quilt that I started 2 years ago...took time off because my sewing machine was in the fritz. Got a new one for my birthday and immediately finished this project. Was easy to just pick up where I left off. Great tutorial! Thanks for the great tutorial! 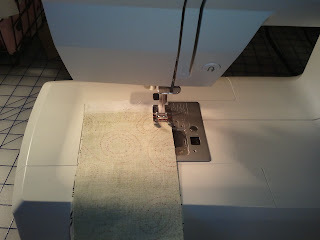 I'm not very experienced at quilting so it was great to have a step by step! I couldn't resist making a Christmas version! I'm more than happy to discover this great site. I wanted to thank you for ones time for this particularly wonderful read!! I definitely appreciated every part of it and I have you book-marked to check out new things on your site. Love this tutorial...! All the photos make it super duper easy to follow... Pretty much even without words. :) If appropriate/permissable, is there some way to share our version with you when finished? Thanks and Happy Sewing!